Writing is like jumping off a cliff blindfolded and trusting that you will land safely. At least that’s the way it is for me. When I started to write Eternal Life Inc., I had no idea where it was going, what characters would appear, or how it was going to end. I had only a vague desire to combine my life-long interests in spiritual development and cutting-edge science in a science fiction action thriller. The whole book sprang from that initial desire, and when I started writing it, I tried to let the book go wherever it wanted to go. This isn’t as easy as it sounds. It is a constant battle to let go of the need to be in control and to just jump off that cliff and let the story take you where it will. What it comes down to is an act of faith that the story already exists in some unmanifest form and my job is to work together with it to let it come to expression, kind of like Michelangelo who said that he did not create those sublime statues but only removed the marble from around what was already there. For me “removing the marble” consists of ignoring or trying to shut down all those clamouring voices of self-doubt and criticism in the back of my head that want to be in complete control; analysing and judging every word, telling me this or that isn’t good enough or this isn’t the way the story should go or OH MY GOD, WHAT WILL THE READERS, PUBLISHERS, AND CRITICS THINK! I have to constantly say to myself, screw the readers, screw the publishers, and screw the critics. They have nothing to do with this, the process of writing, because in the end that is only between me and the spirit of the book. When it’s done, the publishers, readers, and critics can have their say, and I would be lying if I said I didn’t care about their opinion, but if I have been true to the spirit of the book, then on one level their opinion really doesn’t matter. I realize this way of writing sounds a bit mystical, even anthropomorphic; as if the book is a living thing or spirit that has an independent existence, like those ancient spirit muses who inspired old time writers from Homer to John Milton. In the beginning, this also bothered me because it was so at odds with the rational, analytical approach to writing I had been taught. You know what I mean; you make a plot outline of each chapter so you know exactly where you are going and what each character will do next because you already have built up character profiles and there is very little room left over for the unforeseen, spontaneous surprises. Then after you have all your soldiers in place, you can begin the battle of writing your book like any good general in control of everything and moving his troops according to plan. I know that there have been many excellent works of fiction written in that way, but it seems such a boring, plodding process to me. For years, these critical voices made it difficult for me to trust myself or the process even though time and again it worked out and above all gave me intense pleasure and satisfaction. Then, I came across a book by Stephen King called “On Writing” in which he compares the way he writes to an archaeologist who discovers a little piece of bone sticking out of the ground (the initial impulse or idea for a story) and as he uncovers that bone, he trusts that it will connect to another and that finally he will uncover a complete skeleton. The idea being that the skeleton or book, like Michelangelo’s statue, already exists buried there and it is the writer’s job to uncover it. Reading King’s book was a watershed experience. I realized I wasn’t the only one who wrote like this. It gave me faith in the way I was working, and I soon discovered that there were many others working in the same structureless, yet strangely structured way. One of the oddest examples is Minette Walters, the “Queen” of the British detective novel. Some years ago, I saw a documentary that followed her through one year of writing a crime novel. The interesting thing was that by page one hundred and six she still did not know who the murderer was! This was mind blowing. I’d always assumed that writers of detective stories wrote in the same logical, analytical way as their detectives worked to solve the crime by uncovering clues and red herrings that had been carefully placed beforehand. But this wasn’t the way Minette Walters worked. So the question is what is happening here? How do those creative writing classes that teach structured out-lines, conscious character building, and writing about things that you know about or have personal experience of, explain a phenomena where the writer has only the vaguest idea of what he is going to write about and no idea of what he is going to uncover along the way and yet still ends up with a highly structured, well plotted story? They will probably nod sagely and point to James Joyce and mumble something about stream of consciousness and the subconscious as if that explained everything when in reality it explains nothing because nobody knows where thoughts come from in the first place, let alone whole novels of thoughts. Now wait a minute, you’re going to say, everyone knows thoughts come from the brain. While it is true that neurophysiologists have discovered that certain areas of the brain are active in different kinds of thought processes, they still have no idea where an actual thought comes from. In fact, a group of young, radical neurophysiologists have theorized that thoughts don’t come from the brain at all, that it is just an inter-face receiver like a radio or TV, picking up impulses from somewhere else. They theorize that this somewhere else is what physicists call the quantum field which they define as an infinite, eternal, non-place, existing outside of space and time, containing unlimited potential energy, and is the source of everything that exists or could possibly exist, and to top it all it interacts with human consciousness and is therefore itself somehow conscious. This quantum field is beginning to sound a lot like what saints and mystics down the ages have called the realm of the spirit or even the mind of God, and with quantum theory it seems that modern science has curled back on itself and bitten its own tail only to discover that what it is biting into tastes suspiciously like religion. In any case, these young neurophysiologists have no time or appetite for religious implications and instead remain strictly scientific, theorizing that all thought results from a material meat mind interfacing with this non-material quantum field out of which the original seed thought springs. This seed is then filtered through the meat mind receiver which, like a badly tuned radio, distorts it with the static produced by the individual’s unique biology and personality, for example; disease, traumas, beliefs, needs, likes, dislikes, etc. However, it is not only individual thoughts that are waiting to be expressed but whole books of thoughts, an infinite number of books about all possible and impossible worlds that are waiting on the far side of material reality for someone to give them expression. And that bring us back to Eternal Life Inc. and the strange, structureless structured way it was written. If quantum physics and the theories of radical neuro-physiologists are anything to go by, then the way Eternal Life Inc. was written and the way scores of other books are written is not so crazy after all. In fact, by trying to shut down the personal critical filters that say what a story should or should not do, we are, hopefully, making it easier for the story to come to fuller expression, even though I must admit there is also a great deal of conscious editing and polishing that goes on afterwards because a story never makes it unblemished through the distorting filter of my meat mind. 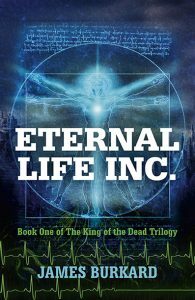 When I wrote Eternal Life Inc., I was driven by the desire to write a science fiction thriller that combined spirituality and cutting-edge science, and by and large I think I succeeded. I believe that Eternal Life Inc. represents the spiritual future of a new type of science fiction that walks the wild side of quantum physics into the spirit realm of mystics, saints, and shamans. Although it is an electrifying roller-coaster ride of action and ideas, derailing off quantum cliffs and taking the reader into a dystopian world of gods and demons, Eternal Life Inc. remains true to the time-honoured ideals of good winning over evil, love conquering all, and courage triumphant against all odds. It remains an old fashioned, page turning adventure about a reluctant hero and a warrior heroine, who fight and fall in love in a post-apocalyptic world where the gates of eternal life have been thrown open to a demonic alien invasion. What more could you wish for? James Burkard is an avid science-fiction fan. He is also obsessed with science and devours scientific books and articles, especially those that question accepted paradigms. He lives in Sweden.